Should you keep your backup data in a safe? Even if somebody steals my iMac and Time Capsule, it is very unlikely the safe will get stolen. And most likely the safe will survive a house fire. I also have an encrypted sparse bundle with mission critical financial data stored there. Given the above, would you still recommend a cloud backup service? Yes, yes, yes, and also, yes. It’s best to have three copies of your data in distinctly different forms: live on your computers, an easily accessible backup or clone, and an offsite or cloud continuously updated backup. Hard drives are cheap and unlimited cloud-based backup services are cheap. Encryption is free. Offsite storage, in a safe-deposit box or other location, shouldn’t be expensive, either, or could be free. You can read this recent article that’s designed to help CrashPlan for Home users find a new backup service, as the second half of the article describes a general set of backup strategies and our recommendations for services and software. As far as the fireproof safe: it isn’t really what you might think it is. Fireproof safes are fireproof with a bunch of conditions, not against all fires. When you purchase a safe, you’re buying a promise that the interior temperature won’t rise above a certain number of degrees for a minimum period of time with a fire of a given temperature. Fireproof safe also have to be waterproof, so that the fire’s cure won’t destroy a safe’s contents. For magnetic media, like hard drives, you need a safe that limits the interior temperature to 125°F or 150°F even as a fire rages without. The UL certifies safes at 125°F (magnetic media), 150°F (film), and 350°F (paper). CDs, DVDs, and flash memory should survive at temperatures above 150°F, but not as hot as 350°F, and there’s no specific standard for that. You should also look for an ETL certification on a safe you purchase. The UL certifies safes for 30 minutes to 4 hours at 2,000°F. An average house fire burns at 1,100°F, so a cooler fire means protection lasts longer. The Wirecutter did a real-world fire test with safes, and found an inexpensive model with a UL rating for 350°F internal temperature for 30 minutes. It tested a flash drive and DVD, and they survived and were readable after 30 minutes at 1,300°F, after which the fire was put out with water. 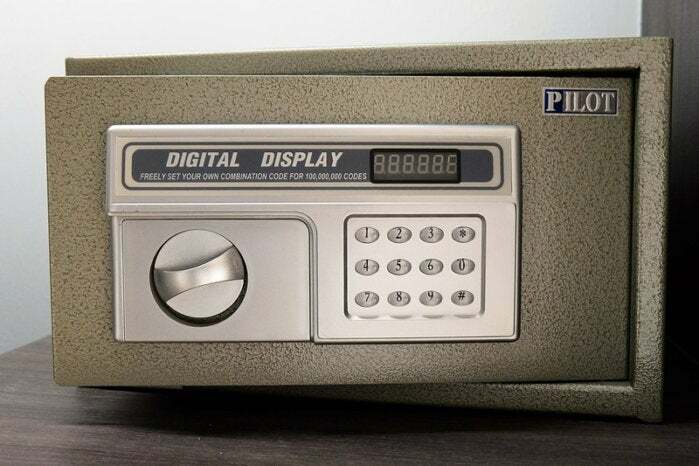 You should also consider how burglar-resistant your safe is. A determined someone might be able to break into a safe, and steal the backup drive along with your computer and Time Capsule, even if they were looking for other valuables. The moral: back up to the cloud or at least rotate a clone or Time Machine drive regularly to a secure offsite location. If you’re worried about your data leaking out to other parties online or if stolen from wherever you’re caching it, you can (and should) encrypt external drives and use your own encryption key with several cloud-hosted backup services. Frankly, I’m more worried about your Time Capsule being stolen than everything else: Time Capsule cannot be encrypted, making it a plum prize to a savvy thief.